"For the most part, we came for the wildlife and saw loads - otters, red deer, golden eagles and some great shots of a sparrow hawk hunting plus a selection of red squirrels as we had breakfast"
"Lovely cottage in idyllic situation. Hospitable, helpful hosts who provided for all our needs"
"Thank you for providing a home for my family to share in your idyllic little piece of the world...Dean Lodge is the ideal home base whatever your intentions. Job well done and thank you once again"
"We thought the apartment was one of the most warm and comfortable we have ever stayed in.The view from the decking with a morning coffee or late afternoon beer was just fabulous!" Thank you for your interest in this 4 Star, Trip Advisor Certificate of Excellence home for your holiday.To check availability and book please use the buttons on the left of this page. 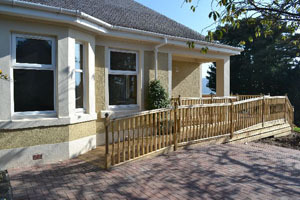 Enjoy your Arran holiday in the only self catering property in the Ayrshire and Arran area that has been accredited with 4 Stars and awarded Category 2 Accessibility ( Assisted Wheelchair Users) by Visit Scotland and also was awarded a TripAdvisor Certificates of Excellence in 2017 and 2018. Therefore, whether you wish an active or relaxing holiday, or if you are less mobile, you will find that this holiday house is ideal for you. Have peace of mind knowing your accommodation has been quality assured and has 100% 5/5 reviews from visitors . Use the calendar button then search button to view availability for your preferred dates and to book on line. 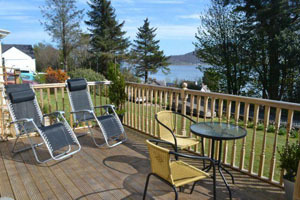 Stunning sea views, of Lamlash Bay and Holy Isle, can be enjoyed while relaxing inside, or outside on the extensive decking. Prior to your relaxation,you may wish to walk, climb, visit one of the beautiful beaches,play golf on one of seven courses, visit one of the many visitor attractions or ,indeed, just stay and relax all day in peace at home in your seaside holiday cottage. There is ample off road level parking with plenty space for wheelchair access or pram/child access to vehicles and the ramp to the decking. A lockable shed is also provided for you to store outdoor gear / cycles etc..
Well behaved pets are welcome which can be up to two dogs. There is an additional cleaning charge of £15 per visit for pets and a returnable £50 deposit.